After we finished at the Statue of Liberty, we took the ferry to Ellis Island. We did a few of the activities in the museum, but I had another goal in mind. You see, my maternal grandfather and his mother (my great-grandmother, of course) came in through Ellis Island very early in the 20th century. I was far more interested in sort of getting in touch with their experiences while they were there. I looked at floors and walls and doors, searching for things that were probably there when my ancestors were. The Main Building has been restored and looks beautiful. The museum was mostly photographs and interpretive signage and things of that nature and didn’t have much in the way of artifacts. We spent some time exploring the building and discovered the Great Hall, which I was totally unable to do justice to in photographs. Then we went outside and my son got some rest while I examined the Wall of Honor. The Wall of Honor is a series of metal plaques that have immigrants’ names inscribed on them. The Statue of Liberty – Ellis Island Foundation raised the money to renovate the north side of the island by putting names on the wall in exchange for a donation. I am not sure if they are still adding names to the wall. The Foundation’s website seems to indicate that they are, but I thought I saw something at Ellis Island indicating that they are not taking any more names. If they are, I am very tempted to add my great-grandmother’s name, since she has many more descendants than my grandfather does. 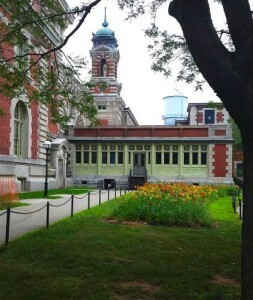 The area behind the Main Building is well worth visiting, if you go to Ellis Island. The Wall of Honor circles a little bit of greenspace. There is also a place where one can see some of the foundations of Fort Gibson, which stood on the island before Ellis Island was used for immigration. You can see the skylines of both Manhattan and Jersey City from the grounds of Ellis Island, as well. And off tucked by the northeastern corner of the Main Building, there was the prettiest little bed of lilies (see image). A bed of lilies on the northeast side of the main building of Ellis Island. Overall, I was not terribly impressed by the museum, but I found that my visit to Ellis Island was definitely worth the time it took to explore the island, nonetheless. And maybe someday they will get the money to complete the restoration of the south side of the island, the buildings of which are falling into disrepair.